When it comes to buying a kayak, you won’t go wrong with choosing the best inflatable kayak. Inflatable models are almost as sturdy as their more rigid cousins and can withstand the beating that rough waters give. Since they can deflate and roll up to a small size, they’re easy to store and transport, so you can bring them with you anywhere you go. The AE1007-R is worthy every penny of its almost $800 price tag. It’s pre-assembled in the factory, so you only have to unfold and inflate it. It comes with three seating locations, allowing you to use the kayak on your own or with a friend. It’s constructed with three layers of material for effective puncture resistance, and it has built-in aluminum ribs that improve its tracking. 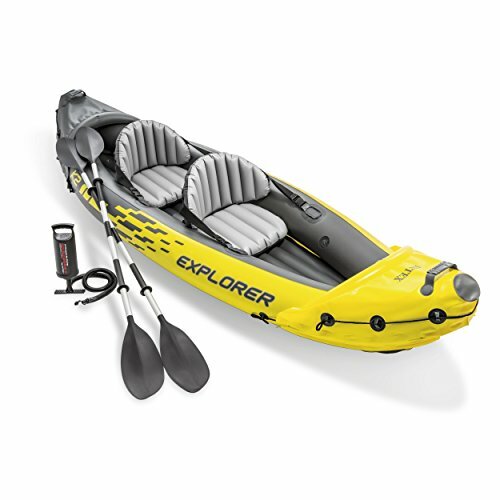 If you’re planning to on a white-water rafting adventure, you’ll want to get the SE370K_P. It has an I-beam floor and a 38-millimeter Polykrylar hull which, combined with the self-bailing drain valve, allows the kayak to tackle up to Class III rapids. It’s also durable enough to withstand sharp dog nails, so you can take your canine companion with you without having to worry about your watercraft. The SE370K_P can be yours at around $300. 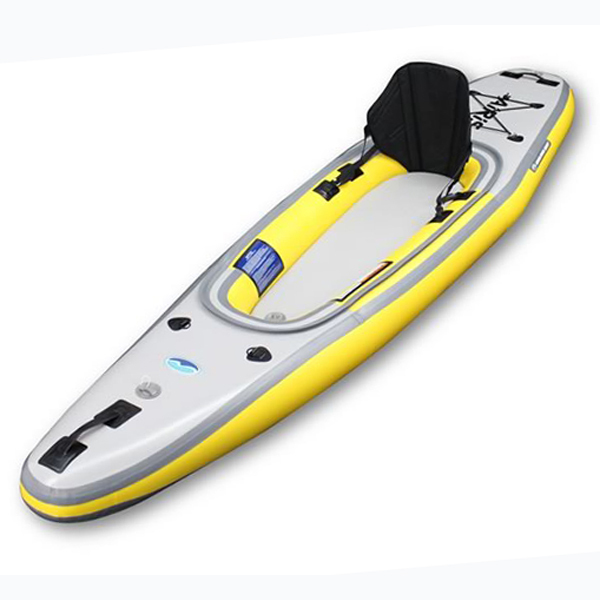 This kayak has a low design that makes it ideal for lakes and mild rivers and has eye-catching color and graphics for excellent visibility. Its compact and lightweight build means it can be easily transported to almost anywhere, while its durable vinyl build and I-beam floor makes it sturdy and stable on water. Inflating and deflating it is easy since it has two Boston valves on both sides. Take it home with you for around $150! 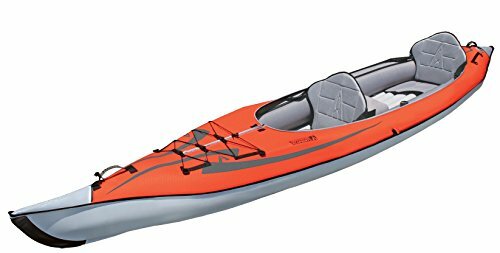 With its 22-gauge PVC construction and Airtight System, this kayak can be used on lakes without any leaking. It’s even built with multiple air chambers, which means that it can stay afloat and ensure you’ll make it to the shore even if one chamber gets punctured. It can carry up to 400 lbs and hold up to two people, although you can remove the middle seat if you want to go kayaking on your own. You can buy this online for around $150. The Quikpak K1 might seem too expensive at approximately $160, but it’s actually great value for money. 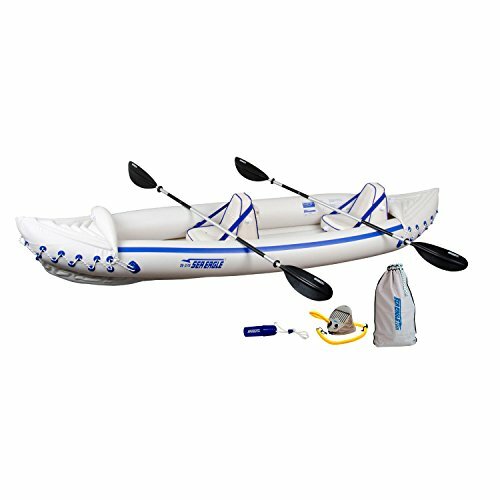 Its 21-gauge PVC construction ensures it’s durable enough for lake use, while its tarpaulin bottom, multiple air chambers, and Double Lock valves add extra protection. 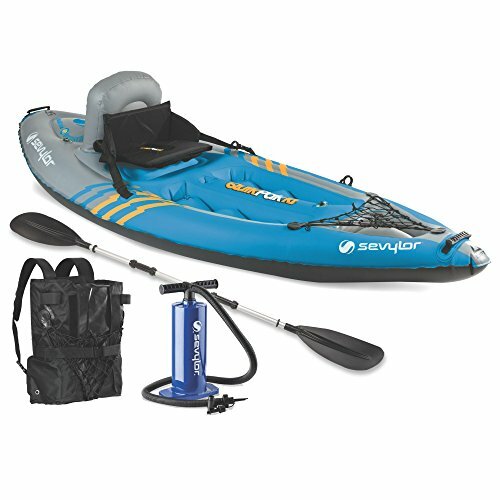 Its five-minute setup ensures you’ll spend less time inflating your kayak and more time relaxing on the lake. It can hold up to 400 lbs, so you can bring along a beer cooler, fishing gear, and other equipment. 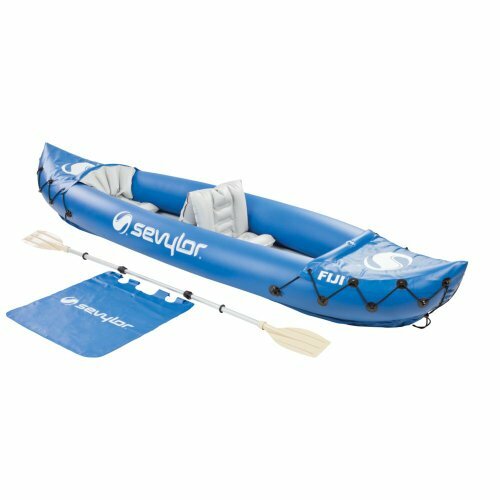 Finding the best inflatable kayak can be a challenge, but you can make it easier by using our list and checking out the products above!